The general director of medical charity, Medecins Sans Frontieres (MSF), Christopher Stokes, right, talks as MSF's Country Representative for Afghanistan, Guilhem Molinie, left, listens, during a press conference at their office, in Kabul, Afghanistan, Oct. 8, 2015. Doctors Without Borders said Thursday that 33 people are still missing days after the U.S. airstrike on the international medical charity's hospital in Kunduz, Afghanistan killed 22 others. The medical group, known by its French acronym MSF, said nine of the unaccounted for are patients and 24 staff members. He said more bodies could be found inside the hospital, but MSF is waiting to regain access to the facility after ending its operations in Kunduz. "We are still in shock," said Guilhem Molinie, the group's Afghanistan representative told reporters in Kabul. "We lost many colleagues and at the moment it's clear that we don't want to take the risk for any of our staff. We don't control the hospital." MSF ended its Kunduz operations after the aerial bombardment last Saturday and has demanded an independent investigation into the attack under the Geneva Conventions. The group says probes under way by the U.S., Afghanistan and NATO are insufficient and has suggested that the attack amounted to a war crime. Those killed in the airstrike included 10 patients and 12 MSF staff members. In this photograph released by Medecins Sans Frontieres (MSF) on Oct. 3, 2015, fires burn in part of the MSF hospital in the Afghan city of Kunduz after it was hit by an airstrike. U.S. President Barack Obama apologized Wednesday to the medical group's president, Dr. Joanne Liu, for the attack, launched by the U.S. after Afghan forces requested help to rout Taliban fighters from inside the hospital compound. In a statement issued Wednesday afternoon, Liu acknowledged receiving Obama's call, but repeated her earlier demand for an independent panel "to establish what happened in Kunduz, how it happened and why it happened." Hours before her conversation with President Obama, Liu said the organization, known by its French acronym MSF, cannot rely on the internal probes being conducted by the U.S., Afghanistan and NATO. White House spokesman Earnest, however, rejected the notion that the attack was a war crime, saying that "no one has offered any evidence that it's anything but a terrible, tragic mistake." 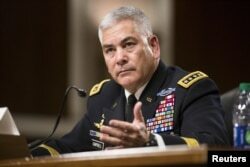 Campbell told a congressional committee Tuesday the hospital was "mistakenly struck" and the United States "would never intentionally target a protected medical facility." "To prevent any future incidences of this nature," he said, "I've directed the entire force to undergo in-depth training in order to review all of our operational authorities and rules of engagement." U.S. Defense Secretary Ash Carter said in a statement, "The U.S. military takes the greatest care in our operations to prevent the loss of innocent life, and when we make mistakes, we own up to them. That is exactly what we are doing right now. We will do everything we can to understand this tragic incident, learn from it, and hold people accountable as necessary."